Soldiers parading on the golf course. With the declaration of war, Ojai Mayor Fred Houk issued a proclamation creating a Civilian Defense Council to coordinate “all war and defense measures in the city and the community.” Routine blackouts and air raid drills were signaled by the bell in the post office tower, and civilian wardens with whistles patrolled the outlying neighborhoods to warn householders to douse their lights. Stores in the Arcade conducted end-of-the-day business behind draped windows, and cars were ordered to pull over and turn off their headlights. Less than three months after the start of the war, on February 24, 1942, the Ojai Valley’s readiness was put to the test when a Japanese submarine slipped into the Santa Barbara Channel and fired 20 rounds from its 5-inch guns into the Ellwood Oil REfinery near Goleta. Although there were no casualties and little damage was done, the incident unnerved locals when told that it was the first attack of the war on the U.S. mainland. That February night, the all-clear signal for Ojai and the Central Coast didn’t come until almost dawn. The blackouts became a nightly occurrence thereafter, and it was several weeks before the standing order was rescinded and Ojaians resumed normal activities after nightfall. Residents of Ojai, as in all American communities, threw themselves behind the war effort by raising money for the Red Cross, purchasing war bonds, rationing rubber tires, collecting scrap metal, nylon, and silk, sewing bandages and “comfort kits” for the wounded, even collecting cooking fat that was used to make munitions. “Everyone was involved in the war effort,” remembers lifetime Ojai resident Shirley Dunn Brown. She would soon leave Ventura College to work as a radio contact for the civilian fire and aircraft spotters at an observation post on the old Raymond Ranch near San Antonio School. During February of 1942, a U.S. Army regiment of some 3,000 troops moved south along the California coast from Fort Ord, digging foxholes and patrolling several locations on the beaches until it reached Seaside Park in Ventura, where it established regimental headquarters in the winter of 1942. The regiment’s 1st and 3rd battalions occupied “on line” positions on the beaches from Gaviota to Malibu, practicing “stand-to’s,” alerts, and patrols. Officers filled their intelligence journals with notations of alleged submarine sightings (which were later proven to be only sea lions) and mysterious lights reported along the blacked-out coast. Meanwhile, Colonel Frank Dunkley was ordered to take the 2nd battalion inland as a reserve force. 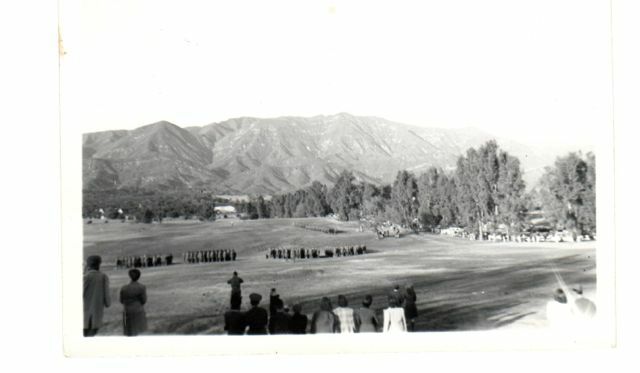 Seeking a location for the battalion’s training base, he discovered the Ojai Valley Country Club, which operated at that time as a winter resort. 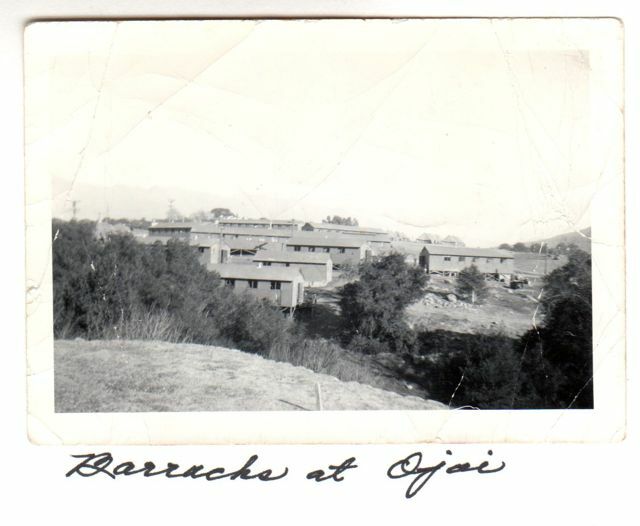 Ojai’s weekly newspaper then known as “The Ojai” reported that Army officers had visited the valley during the first week of May to scout locations for a “small unit” of soldiers. “The telegrams flew back and forth from Ventura to Toledo, Ohio,” recalls Fahlman, as the Army sought permission from the Edward Drummond Libbey estate to occupy the private property. Three weeks later, a battalion of 1,000 men took over the former country club. “Everyone thought we were going to ‘O-jay,” remembers Bob Branch, a longtime Ojai resident who was then a young operations sergeant. “We were all from out of state, and we didn’t know how to pronounce the word, not even our commanding officer,” he chuckles. A plea went out to Ojai homeowners with extra rooms or cottages to rent to make them available to the wives of soldiers who had followed their husbands to the new base. Many Ojai residents remember the influx of military visitors. David Mason’s grandmother’s house on Fox Street had a parlor that was diode into apartments for 4 army wives, and Shirley Dunn’s mother rented out rooms in their large family home in the Arbolada. Military tents blossomed on the Country Club grounds. Enlisted men set up over 125 tents on the southwest side of the golf course, while some 20 line officers were housed in the clubhouse. Bob Branch remembers erecting the platform tents with wooden floors brought up from the Seaside Park headquarters: “It was a typical army tent camp with six enlisted guys in a tent. Each of the 4 companies first stationed there–E, F, G and H–had their own mess tent. Systems of open latrines–slit trenches–were dug into the golf course.” Wooden barracks were added a few months later. Barracks at Camp “La We La His,” home of the 134th Infantry. The new camp was soon dubbed “Camp La We La His,” meaning “the strong, the brave” in the language of the Nebraska Pawnee, which was the 134th regimental motto. Roads were built between the barracks and the officer’s quarters and were respectively named Dunkley Road for the battalion commander, and Miltonberger Road for the regimental commander. Second Battalion Field in front of the clubhouse was designated the official parade ground, and the long, tree-shaded entrance road tot he former country club was renamed Nebraska Road in honor of the regiment’s home state. In time, the camp constructed a dispensary, a chapel, kitchens and recreation halls. More than a few couples recited their wedding vows before base chaplain Capt. John Reents, whose little daughter often stood in as a flower girl. Wedding receptions were held on the patio of the former clubhouse. Other romances bloomed between local women and the soldiers stationed in Ojai and led to weddings held out of state when the men were transferred to distant locations. Ojaian Shirley Dunn Married Capt. Brown in 1944. Bob Branch wed Norma Nichols of Ojai the same year, and Pvt. Fahlman married Madge Kilbourne, daughter of the newspaper’s editor, in 1943. One night a young Betty Jo Buckner joined a group of her school friends who dared each other to sneak up the the Country Club “to spy on the Army.” Armed sentries stood guard every night at the three entrances to the property: at the intersection of Country Club Road and Country Club Drive, at the service entrance further south on Country Club Drive, and at the greens keeper’s house on Highway 33 and Ojai Avenue. The young pranksters managed to stay hidden from the rifle-toting guards, but by the time they got close enough to see anything interesting, their courage had disappeared and they ran back to town. Nevertheless, the life of a soldier must have impressed her, because two years later, Betty Jo Buckner became the first local woman to enlist when she joined the U.S. Air Force as a field locator and was stationed for the duration of the war at a bombardier training base in New Mexico. Pauline Emerson Farrar was fresh out of Nordhoff High School in the summer of 1942 and was working at Bill Bakers Bakery. In town, a hospitality center serving coffee and doughnuts was opened for the soldiers at Russ and Ruth Brennan’s electrical shop on Signal Street, where the Dancers Studio is located today. Villanova School made its pool available to the Army for swimming and diving, and softball games were organized at Sarzotti Park between the soldiers and local teams. Dances were held at Nordhoff High School (then located where Matilija Jr. High School stands today). It wasn’t long before the community volunteers running the little hospitality center out of Brennan’s Electrical Shop moved their activities to the larger Jack Boyd Club, then located next to Libbey Park at the present site of the Bank of America [now Nomad Gallery], which became Ojai’s official U.S.O. headquarters. An Army dance band, formed out of the larger regimental band, practiced at the Boyd Club and played at the frequent dances held in the club’s basement, at the high school, or at other county U.S.O. locations. Campbell Fahlman, who played in the dance band, remembers those parties with special fondness. “I used to play the drums and watch this pretty girl who danced with all my buddies,” he recalls, “so I decided I’d better figure out a way to meet her.” He did, and married her a year later. Recognizing “the importance of maintaining close understanding and high morale between the U.S. armed forces and the civilians among whom they are stationed,” Col Miltonberger assigned a Pvt. Gorfkle and a Sgt. Lorimer to submit occasional army news items to “The Ojai” for publication. The troops were immensely popular with their Ojai hosts. During December of 1942, locals teamed up to furnish two recreation halls on the base–one was was remodeled from the old garage building of the country club–by contributing a piano, tables and chairs, rugs and curtains, books and games, and had them both ready for use by the holidays, complete with fresh fruit and nuts. Trees provided by the Forest Service station in Ojai were decorated with paper chains and popcorn made by Ojai school children. Ojai churches sent their choirs to sing at the base chapel. Rumors circulated that the 134th would soon get orders to overseas duty. Some 1,000 townspeople turned out to watch would be the regiment’s last ceremonial parade on January 10, 1943. Within days, “Ojai’s beloved Army group,” as one newspaper editor wrote, was abruptly pulled out in January 1943, leaving behind them an almost deserted camp, many local friendships, and not a few sweethearts. The soldiers of the 134th 2nd Battalion were sent to hot spots in both the European and Pacific theaters of war. Some were assigned to the Aleutian Islands, while most joined the ground divisions that ultimately merged with Patton’s Third Army in France. During the eight months the 134th 2nd Battalion had been stationed at Camp La We La His, Ojai Red Cross volunteers had mended more than 2,000 uniforms for the soldiers,sewed military piping on 1,000 of their caps, and helped find rooms and employment for Army wives. Hospitalization and baby equipment were arranged for expectant Army mothers. Valleyites collected hundreds of rags that the soldiers used to care for their equipment, and gas heaters were donated to warm the wooden barracks during the winter months. By May of 1943, a convoy of new Army units from the 174th Infantry arrived in Ojai from Fort Dix, New Jersey, with hundreds of raw recruits hailing from upstate New York. The promptly renamed their new home Camp Oak. The social schedule of popular U.S.O. dances and Army band concerts were resumed, along with the collection of donated furniture for the camp facilities. Sports events were played again at Sarzotti Park between the soldiers and local teams. The base’s new Army Chaplain, Lt. Frederick E. Thalmann, performed still more weddings at the officers’ club. By the end of January 1944, the 174th Infantry had pulled out of Camp Oak and was assigned duties in Oregon, Arkansas, Oklahoma and Alabama. Life in town quieted down again, until word came that the U.S. Navy had allocated $80,000 to improve the camp for the Navy’s use. Seabees from Port Hueneme spent several weeks working on the barracks and the clubhouse and even adding two swimming pools. In May 1944, units of the Acorn Assembly and Training Detachment from Port Hueneme moved in under the command of Capt. Marshall B. Gurney and Lt. Cmdr. Lloyd R. Saber. Like the Army soldiers before them, the sailors became an important part of Valley life, even spending their liberty time helping local ranchers with the harvest during the summer and fall. Ojai firefighters could always count on extra help during an emergency from the Camp Oak Navy personnel, and the high school football games were regularly attended by the Navy doctor and a pharmacist’s mate. In November of 1944, when a commercial airstrip was approved for Ojai’s Dry Lake in Mira Monte (locally known as Henderson Field), the Navy loaned the heavy equipment that was used to grade the landing strip. In April of 1945, locals were thrilled to be invited to Camp Oak to watch an exhibition match played on the camp’s 9-hole course by radio and film stars Bob Hope and Bing Crosby. Proceeds raised from the $1 tickets went to the Navy Relief Welfare Fund. Cmdr. Creighton, one of the Navy’s finest golfers, paired up with Bing Crosby, while Hope’s partner was Gabe Burbank, a former professional golfer who was stationed at Camp Oak at the time. Some 3,000 spectators, civilians and servicemen alike watched the 12-hole match that was marked with the antics of the famous comedians. At the end, the Hope and Burbank team won the contest by the margin of one hole. It was an extravaganza of stars and military brass that focused enormous media attention on the little town and its former country club. Nine days later, on May 8, 1945, VE-Day was celebrated by all Americans, and three months after that VJ-Day brought an end to five years of combat on every continent of the world. Still, it was months before the Navy at Camp Oak made known its intentions about its continued use of the property, although fewer and fewer sailors were seen in town. Rawson B. Harmon, local resident and manager of the Libbey interests in Ojai, announced that the Libbey estate would no longer keep the property but insisted that the Navy restore the links and the buildings to their original condition. Numerous private investor groups made offers to purchase the country club on the assumption that the military would son be gone. But it was not until late summer of 1946, 15 months after the end of the war, that the U.S. government finally auctioned off over 50 barracks buildings and quonset huts, some of which were purchased by locals. Villanova School, which was facing an unusually high enrollment for its first postwar term, bought two large barracks to use as dormitories, and others can still be spotted in the Ojai Valley today as converted residences, workshops and places of business. Work on the reconstruction of the golf course began in December 1946 under the supervision of William P. Bell of Pasadena, the original architect of the famed course, and took seven months to complete. A new swimming pool was built, and tennis courts, stables and riding trails were completely reconditioned. Inside the charming old clubhouse, the dining room, bar, and guest rooms were restored by a team of local workers, including a recently discharged Army sergeant who knew the property better than anyone. Campbell Fahlman had returned to Ojai, the hometown of his bride Madge Kilbourne, and drove straight to the country club where he had been stationed five years before he was sent to join Patton’s Third Army in Europe. Fahlman was hired on as part of the crew that worked on every inch of the 200-acre property throughout the winter and spring months; and on June 7, 1947, the former country club, that had been briefly known as Camp La We La His and Camp Oak, was officially reopened as the Ojai Valley Inn, leaving behind forever its place in the history of World War II. Originally published in the Ojai Valley News. As a military history aficionado who grew up in Ojai and thinking it had no interesting history, I found this connection to WWII, the Japanese shelling above Goleta, and development of the country club absolutely fascinating. As challenging as military life is, I can only imagine that the troops and sailors arriving in Ojai must have thought, “Hey, this is pretty good!” I would love to learn more about the mission assigned to the infantry units posted to Ojai, which I presume we’re used to patrol the coast in addition to the coastal artillery units and fortifications that were erected. As a young kid in the ’60s, I remember playing on the concrete remnants of a coastal gun battery on the NW end of the county fairgrounds in Ventura, near the woods we knew as “The Hobo Jungle.” As I recall, the floods of 1969 finished off the battery emplacement when the Ventura river mouth expanded. I’ve been out to the “battery emplacement”, to which you are referring, more than once. It was probably in the 1980’s the last time I saw it. The State of California Department of Recreation and Parks has a glossy brochure about this specific “battery emplacement”. My wife is an employee with the department and works out of San Buenaventura State Beach Park. Inside the Park Ranger office in the park is a brochure stand. The brochure of which I speak used to be on that stand. You might go to Emma Wood State Beach Park’s entry gate-house and ask about the brochure. Good Luck! It should not be forgotten that for one Ojai family, WWII was a mixed bag of heroism and oppression. The Fukasawa family moved to Ojai in 1917; their children grew up here and attended Ojai public schools. Peter Fukasawa enlisted in the army and served bravely in the 522nd Artillery Battalion of the 442th Infantry Division. George, Kiyo, and another sister spent the war years with their parents incarcerated at Manzanar, a Japanese Internment Camp near Bishop. John fought in the 92nd, 34th, and 36th divisions in Europe. Ironically, Peter’s battalion helped to free the Jewish internees at Dachau in Germany. After the war, Kiyo returned to Ojai and taught at Nordhoff High School for 25 years. My mom. Olga Ramos, was born and raised in Meiners Oaks and met my Dad, James C. Ober at Deer Lodge. He was stationed at Camp Oak near the end of the war and was a cook. His gravestone says he was in the 170th Artillery Regiment, but no army records show the existence of any such Artilley Battalion or Regiment. Does anyone out there know of such as unit that was stationed in Ojai? Next post: Art and About… of Dogs and Their Artists.